Today ALF Group is one of the most important companies in the international furniture market, brilliantly successful beginnings have led to the ALF Group to make continuous research for quality it's mission. New products reflect changes in lifestyles and contemporary trends. The ALF Group dates back to the 1950's. A group of highly skilled, experienced Italian craftsmen founded a co-op located in Francenigo (Treviso) to mass produce wooden furniture. In just a few years, ALF became an important industry in the woodworking market, propelling the Piovesana brothers to buy the company and invest additional resources. Their efforts quickly yielded results. Since the beginning of the 1960's, ALF has been expanding thanks to the success of its skill in the design and manufacture of bedroom furniture. As the market evolved over the years, ALF's farsightedness in meeting customers requirements quickly allowed the company to expand it's production. Today the group has further increased it's market share thanks to specialization in living area furniture, expertise in offering cutting edge service, and guarantee of timely manufacture and delivery of its products. Innovation has always been part of the production culture at ALF. The group's objective is end user satisfaction. ALF Group concentrates style and technology research on specific designs targeted at guaranteeing maximum quality. At ALF Group, the search for innovation is a test bench. Designs and concepts are studied and transformed into what can be considered the invisible quality of the products of "mass production." For example, the modular systems for organizing the home are the result of continuous technology and typological research. These are products that can be freely modified and enhanced, adopting new solutions while at the same time maintaining well proven quality and reliability. ALF Group carefully selects the best materials for its products. Raw material quality determines the high degree of beauty that distinguishes each collection: the choice of the best woods for veneer, the wide range of lacquered colors, and the craftsmanship that creates the current trends. The ALF Group is committed to each of its products performing over time, guaranteeing maximum quality at all times. Design guarantees the long lasting solidity of modular systems, bookcases, wardrobes, beds, accssories kitchens, and more. Synergy is created between the quality of the raw materials and the highly engineered modular systems. ALF Group interprets quality based on its wooodcraft and the craftsmanship of the Veneto region, renowned internationally as one of the most important furniture making areas of the world. ALF strives to expand its knowledge base and uses cutting-edge technology continuously to reaffirm its position of leadership. In 1951, when the coice was made to manufacture on an industrial scale, the ALF Group established the objective of uniting quality and reliability with an innovative design approach and unlimited creativity. All of the products made by the ALF Group are devised and produced in Italy to guarantee conscientiousnes, diligent control of all the phases of production. Parts and raw materials are selected and purchased from top European suppliers. Unbound creativity, conscientious manufacturing, and our specific, innovative technological know-how are what make our products the pride of "Made in Italy." These are all basic characteristics for a company continuously facing the needs of an international clientele. The ALF Versilia Bed, a part of the Versilia Bedroom Collection by Alf Italia. 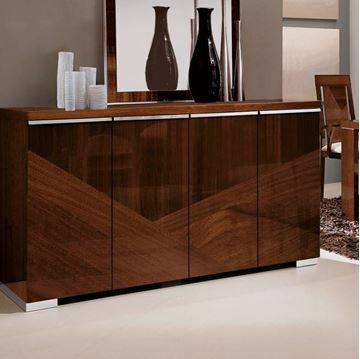 This symmetrical and elegant contemporary design is crafted of beautiful Koto wood. 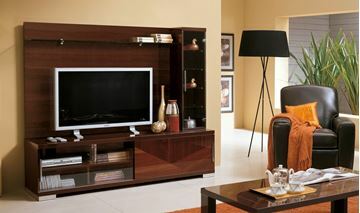 For this collection, the Italian craftsmen align the beautiful Koto wood grain in vertical and horizontal orientations. Polished chrome accent reveals add to the visual balance of the design. It has a luxurious high gloss finish which magnifies and brings the beauty of the wood grain to it's fullest visual potential. The ALF Nizza Bed, a part of the Nizza Bedroom Collection, by ALF Italia. Crafted in a beautiful eco gray oak and clay finish. Both finishes are a user friendly low maintenance flat sheen. We love the wood tone and depth of grain and how it correlates perfectly with the soft texture of the clay top and accents. The design is wonderfully balanced and straightforward, creating beauty by simplicity. The dresser features a unique drawer arrangement, with three large left drawers, and three small right drawers. Drawer glides on the dresser, nightstands, and tall chest are soft closing. The Nizza is a wonderfully user friendly, graceful and soft visual addition to any bedroom in your home. 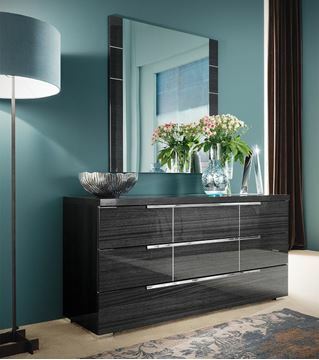 The Versilia Dresser, part of the Versilia Bedroom Collection by Alf Italia. All drawers feature soft closing blue motion hardware. This symmetrical and elegant contemporary design is crafted of beautiful Koto wood. For this collection, the Italian craftsmen align the beautiful Koto wood grain in vertical and horizontal orientations. Polished chrome accent reveals add to the visual balance of the design. It has a luxurious high gloss finish which magnifies and brings the beauty of the wood grain to it's fullest visual potential. 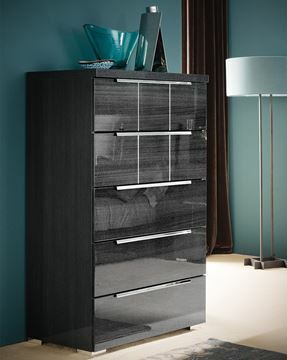 The Versilia Tall Chest of Drawers, part of the Versilia Bedroom Collection by Alf Italia. All drawers feature soft closing blue motion hardware. This symmetrical and elegant contemporary design is crafted of beautiful Koto wood. For this collection, the Italian craftsmen align the beautiful Koto wood grain in vertical and horizontal orientations. Polished chrome accent reveals add to the visual balance of the design. It has a luxurious high gloss finish which magnifies and brings the beauty of the wood grain to it's fullest visual potential. The Eva Bed and two nightstans, a king ensemble, by ALF Italia. Only one ensemble left in stock. Eva is a stylish, contemporary look, with playing mirror images of inlaid mink birch. The high gloss finish on the Mink Birch serves to enhance the beauty and depth of the grain. Chrome handles and a chrome plinth base adorn the cabinets. Made in Italy. 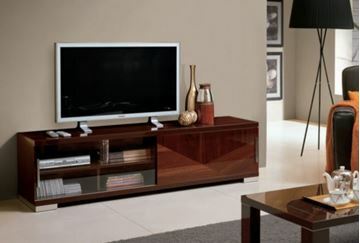 The Capri Entertainment TV Base by ALF Italia. Crafted in beautiful Canaletto Walnut, and finished in a high gloss protective clear coat. The hardware is polished chrome. Features sliding glass and wood doors. Great convenience for storage of your audio/video components. Ideally suited for a 60" TV or smaller, or 70" TV if wall mounting. Made in Italy. The Capri Entertainment Center by ALF Italia. Crafted in beautiful Canaletto Walnut, and finished in a high gloss protective clear coat. The hardware is polished chrome. Features wonderful vertical storage by the tall right side cabinet. The interior of the cabinet is illuminated by a low-e LED light. The lower half of the unit features sliding glass and wood doors. Great convenience for storage of your audio/video components. There is also a floating glass shelf at the top of the unit, making a great place to show family photos or some of your favorite collectibles. The Entertainment center is ideally suited for a 50" TV or smaller. Made in Italy. The Capri Dining Buffet by ALF Italia. Crafted in beautiful Canaletto Walnut, and finished in a high gloss protective clear coat. The hardware is polished chrome. Made in Italy.